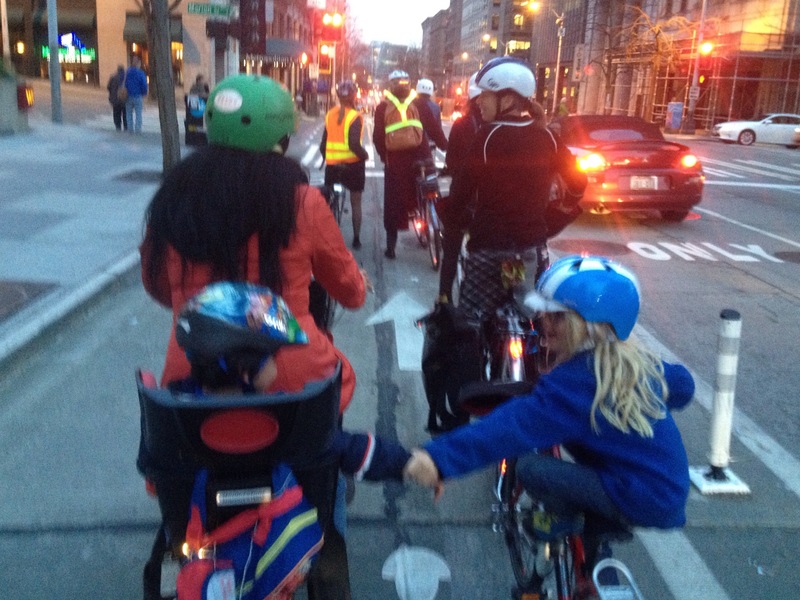 Note: while the Familybike Seattle site (familybike.org) is down, I’m posting Kidical Mass details here again. I’m so exctied that Ginger and kids of Biking While Fashionable are visiting from Portland and since her daughter has requested pastries, LET’S FILL THAT KID WITH SUGAR! We’ll start the show Saturday at noon, in the hopes to miss the forecasted morning showers. Meet outside the Ballard Library (5614 22nd Ave NW, Seattle, WA), famed for its lovely clean restrooms and plastic dinosaurs in the kid reading area. It’s also right across the street from Ballard Commons Park if anyone needs some pre-ride running around. We suggest you head to the area a bit early and check out the new Rodeo Donut pop up in Ballard’s Cupcake Royale around the corner. It’s their first day, starting at 7am until the doughnuts are gone! YUM! Our route will take us around Ballard, checking out the Ballard Greenway, which has had some nice recent additions to further aid its awesomeness. Then we’ll end up at Cafe Besalu (thanks for the bakery suggestion, Kathleen!) for more sweets that we’ll most likely bring to the Adams Elementary School playground…or back to Ballard Commons Park if folks would rather travel full circle. Down to the wire! On the last day to submit control cards, I’ve tallied my 2015 Errandonnee. Just like last year, I discovered the running of the errands is much easier than the recording of the errands. 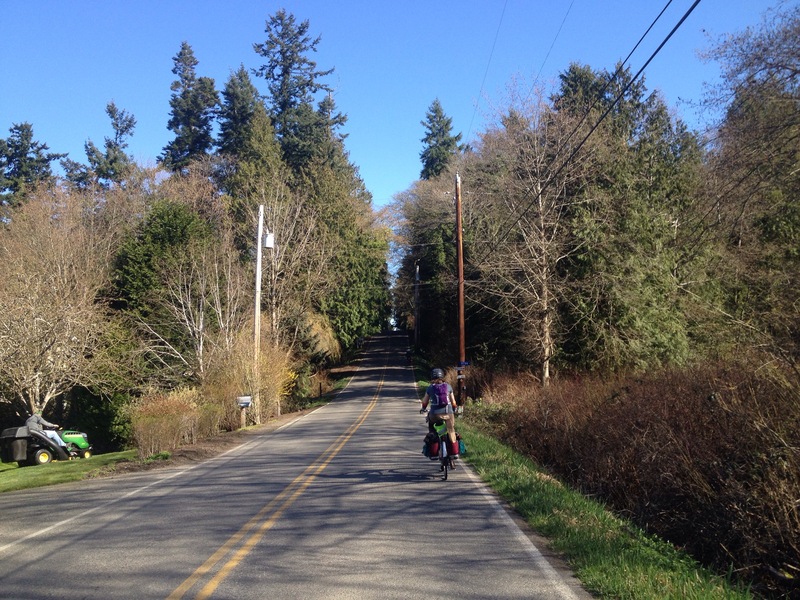 Here’s the gist: Complete 12 errands in 12 days and ride a total of 30 miles by bike between March 5-16, 2015. My total mileage was 138 and doesn’t include numerous grocery store trips tacked onto many of my recorded errands. I wish I had kept track of all the groceries! Maybe next year. I’ll surely be more organized next year. Third year’s the charm. Surly Straggler. My new single-occupant bike! (Though I’ll pull a trailer bike with it at some point because all bikes must be kid-toting bikes, right?). I’ve had it four months, beautifully built by Back Alley Bike Repair. She’s named the Little Struggler. Surly Big Dummy. She’s doing OK adjusting to having a new little sister on the scene and is still the go-to bike for kid hauling and lawn mower hauling (which, doh!, I biked with the day before errandonneering started). Doesn’t seem to mind that in over three years (built by Ride Bicycles) I haven’t gotten around to naming her yet. Specialized Dolce Elite. My original single occupant bike and I still love her (from 2005, Adams Avenue Bicycles in San Diego), but the Straggler with rack and panniers is superior for toting my laptop around while the kids are at school. There are really cool murals next to VAIN! 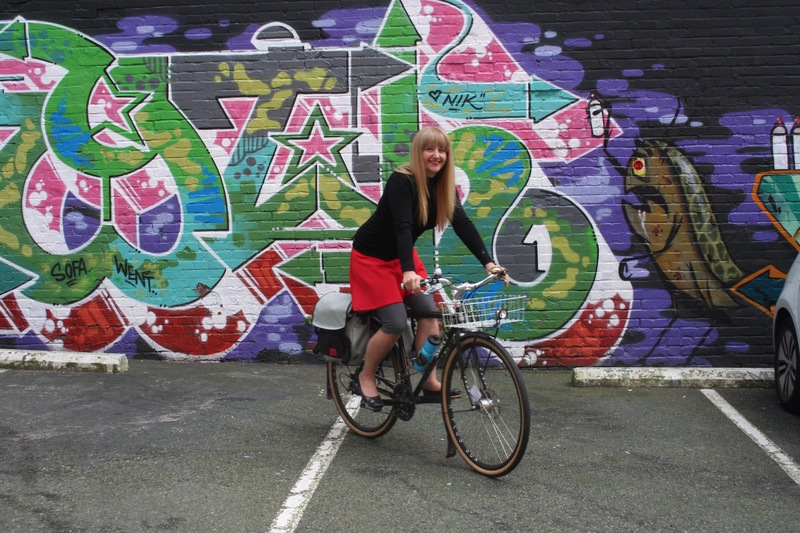 I think this might have to be my author picture for the Urban Cycling book :) Thanks for coming outside to photograph me, Greta! And for the awesome hair cut! 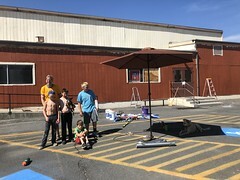 What I learned/observation: It would have been tricky to carry both kids and their bikes with the teeter totter, but one at a time was NBD (no big deal). What I learned/observation: An 80-person late-night waffle ride is big fun! What I learned/observation: Since it was cold and we were pressed for time (so I didn’t want to take two bikes) while the seven-year old was at a playdate, the five-year old and I took the trailer to the nearby “beach”. 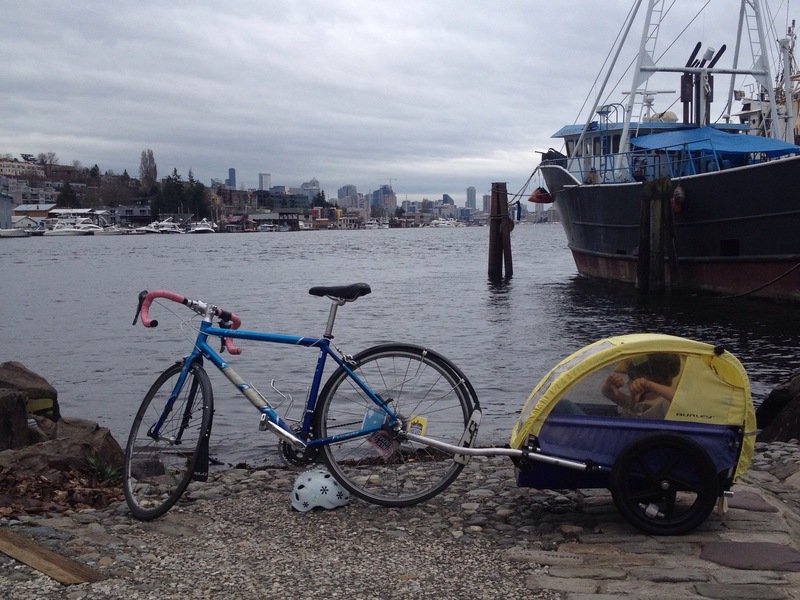 I had forgotten how hard it is to drag the trailer uphill compared to cargo bike. Mad props to all the trailer haulers out there! What I learned/observation: Tom Bihn Super Ego messenger bag (design soon to be retired, *sniff! 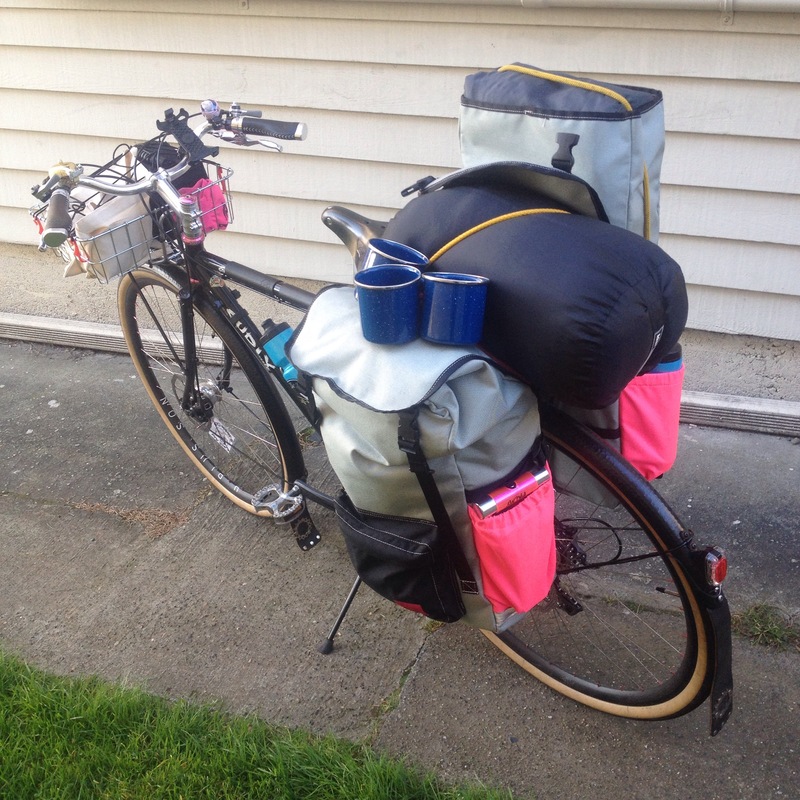 *) can hold a four-person tent if you’ve given your rack to the welder for some welding work during the waffle ride. What I learned/observation: I chose the outbound route from the first park to the second park and let the kids choose the route from second park to doughnuts. They chose one of the hilliest options, but it was nice and quiet and they made it to the top before deciding they were too tired and needed to be carried home…for the flat and downhill part. Fine by me! What I learned/observation: There’s always room to add a growler of beer (top of left pannier, on top of camping stuff). 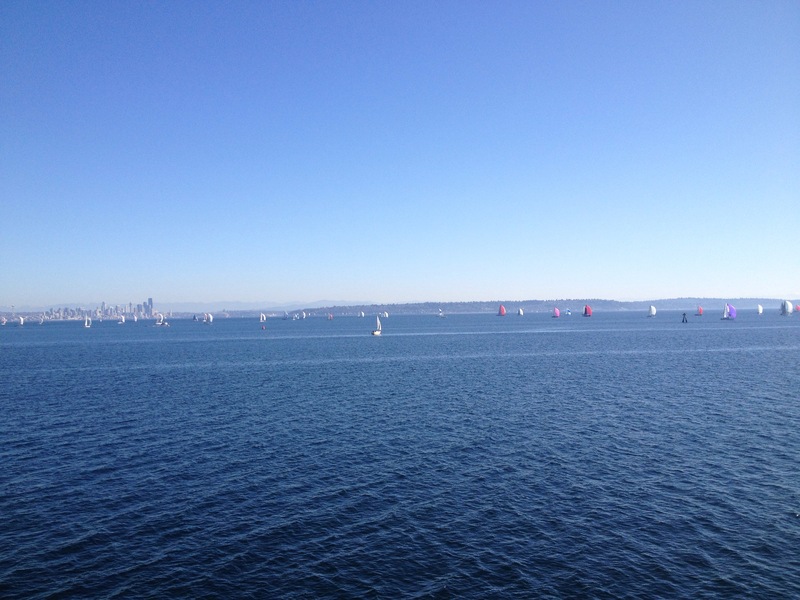 What I learned/observation: After hanging out with friends for a birthday party, we had dinner at the Ivar’s Salmon House Fish Bar and noted how miserable all the families dashing from their cars into the main restaurant looked. 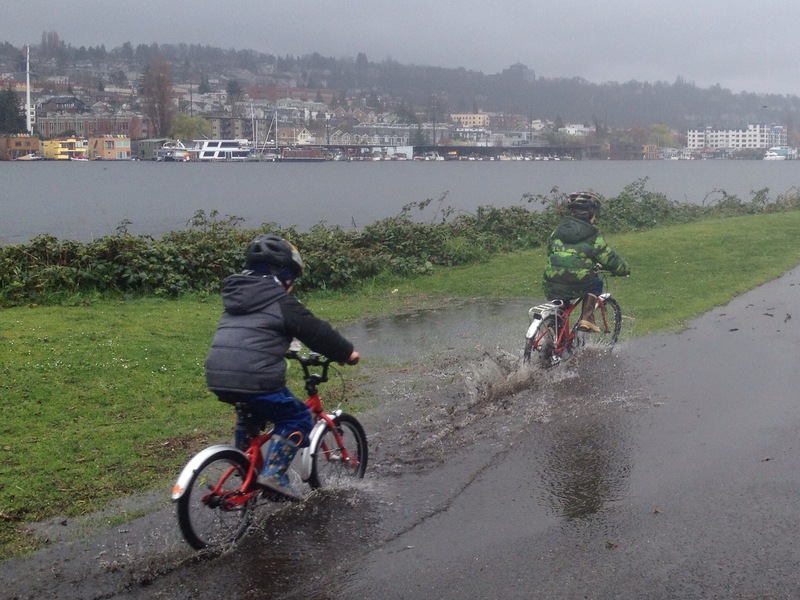 Conversely, we were all smiles getting to bike in the rain. 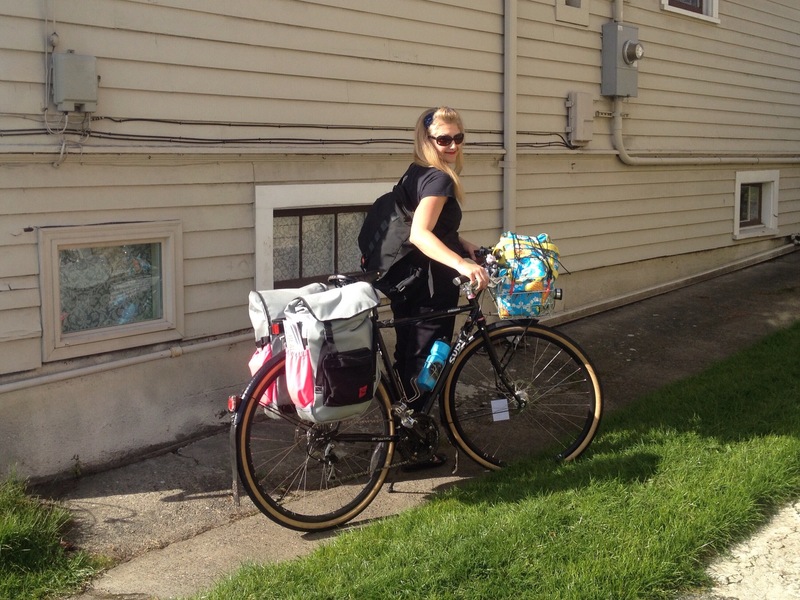 What I learned/observation: I can fit as many groceries on the Straggler as on the Big Dummy! Category 8. 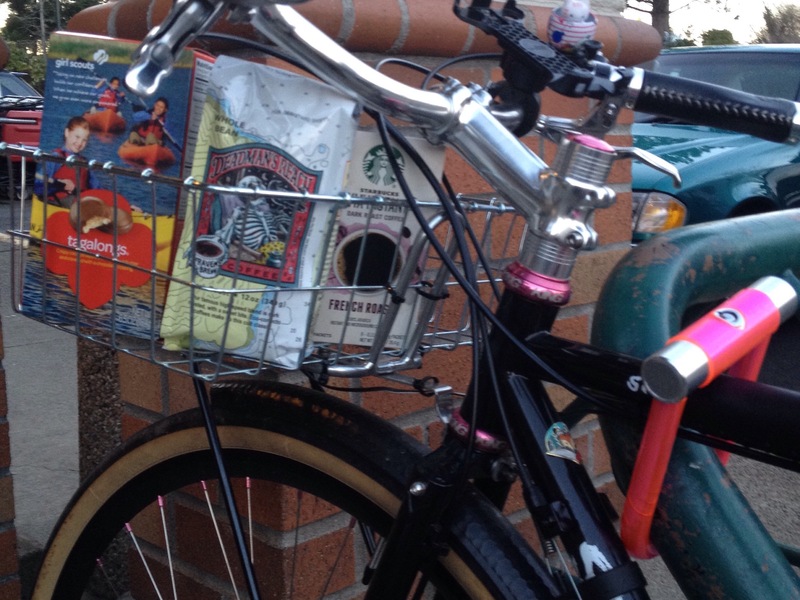 Store: Forgot the coffee beans for bike camping. 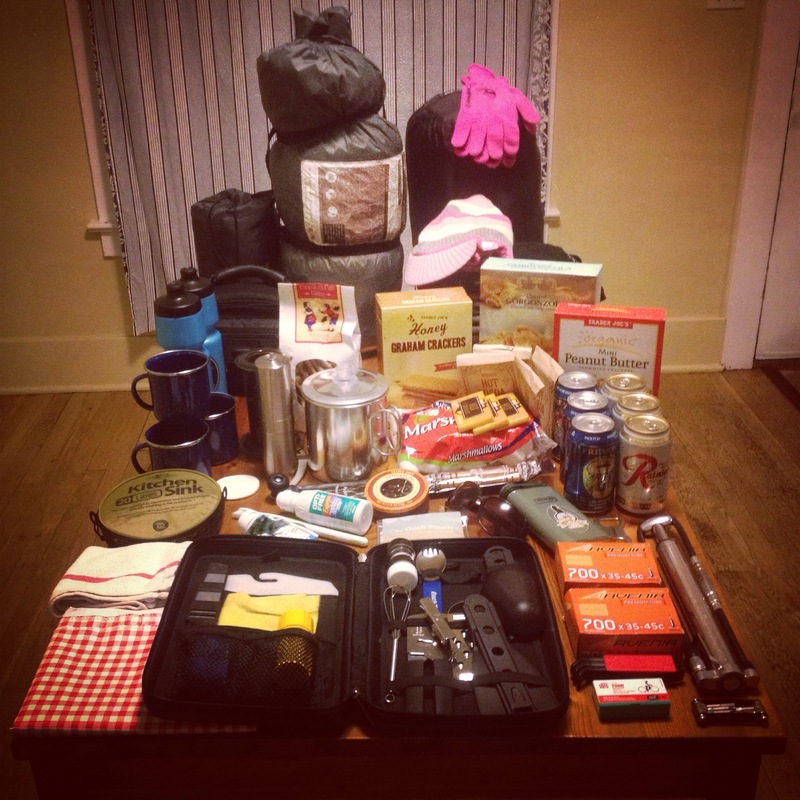 What I learned/observation: Next time camping: make a check list! Also, do other errandonneurs admit when they get lost and tally the extra mileage? Uh, purely hypothetical. 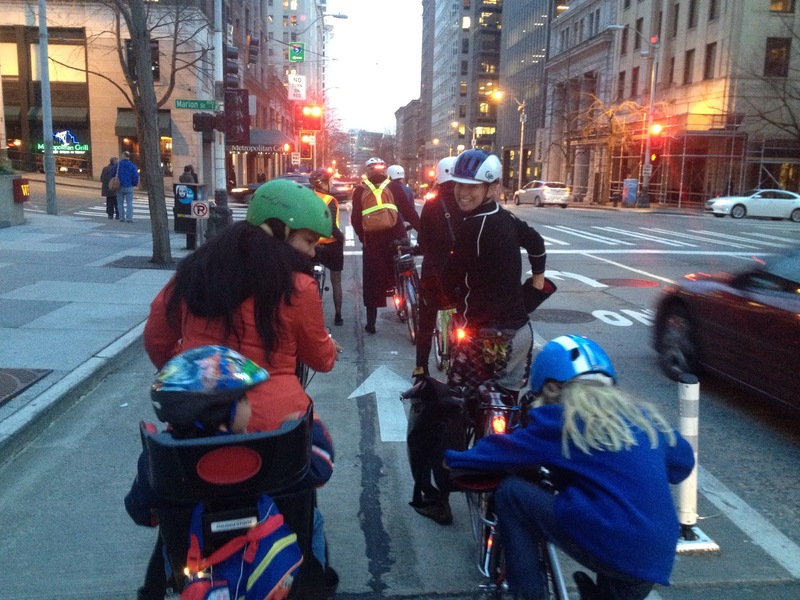 I don’t usually post things that don’t pertain to family biking or cargo biking, but this small-bikes-no-kids camping trip was essentially a test run for our summer Kidical Mass bike camping trip and I want to remember my observations and solicit advice, so on the blog it goes! Last weekend’s camping trip was just three women, two of us with two kids a pop left at home, all three of us with longtail cargo bikes (Ellie: Kona Ute, me: Surly Big Dummy, and Alyssa: Xtracycle EdgeRunner) left at home in favor of our regular bikes (Ellie: Soma San Marcos with Nitto Albatross bars, me: Surly Straggler with Soma Sparrow bars, and Alyssa: Surly Cross-Check with Surly Open Bars). 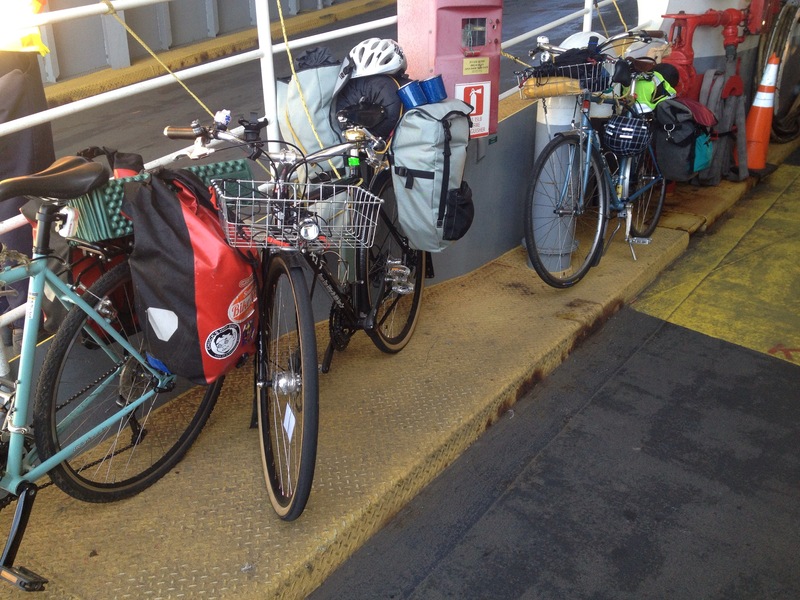 For background, here’s the 2014 family bike camping trip, the 2013 family bike camping trip, and the 2012 family bike camping trip. 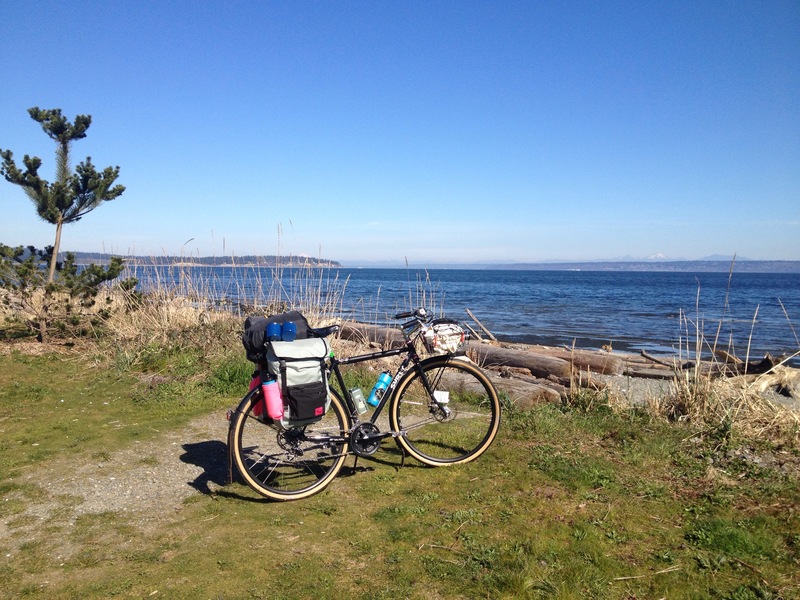 And you heard it here first: this summer’s family bike camping trip will happen August 15-16, 2015. Maybe even August 14-16 because I want to do two nights. Note: this is the week after Bike for Pie because I’ve decided it’s just too much to do both. 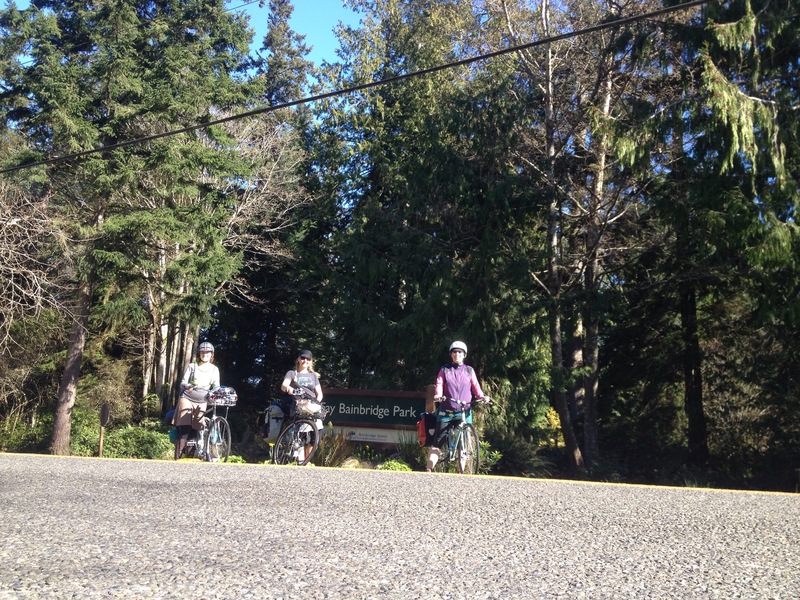 There will probably also be a big family bike camping trip June 20-21, 2015. And here it is all loaded on the little bike! I put most everything in the left pannier to leave the right pannier available for the tent. I shoved my sleeping pad on top of the tent and intentionally stuck the mugs on the outside of my left pannier because I thought they’d look cute out there. My front basket holds just snacks and dSLR camera. In past years I’ve taken our four-person car-camping tent, the REI Basecamp 4, on the camping trips, but for this trip I’m carrying Alyssa’s four-person REI Halfdome 4. 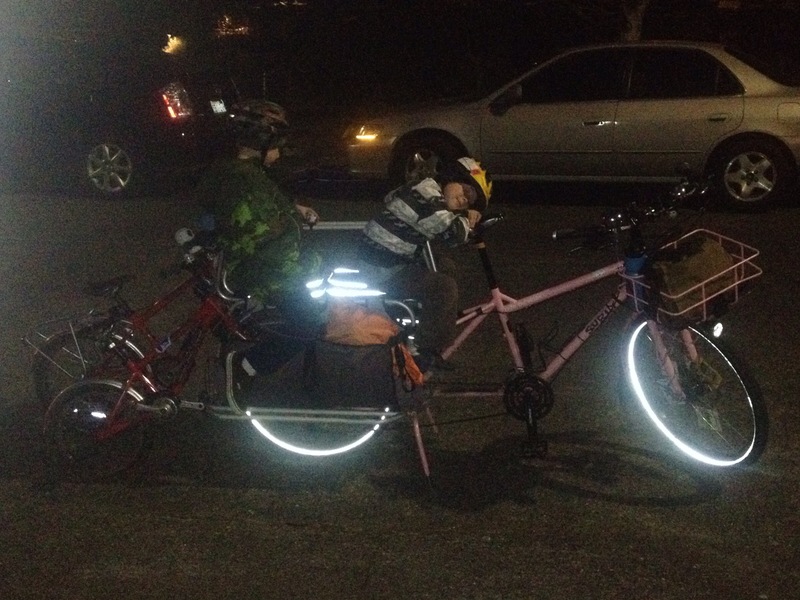 By the way, there is nothing funnier than watching cargo bikers argue over who gets to carry the tent. But there is nothing less funny than having to listen to the “cargo intervention” jokes by the other two cargo bikers at the expense of the winner! Obviously, I won the right to carry the tent. Woo hoo! 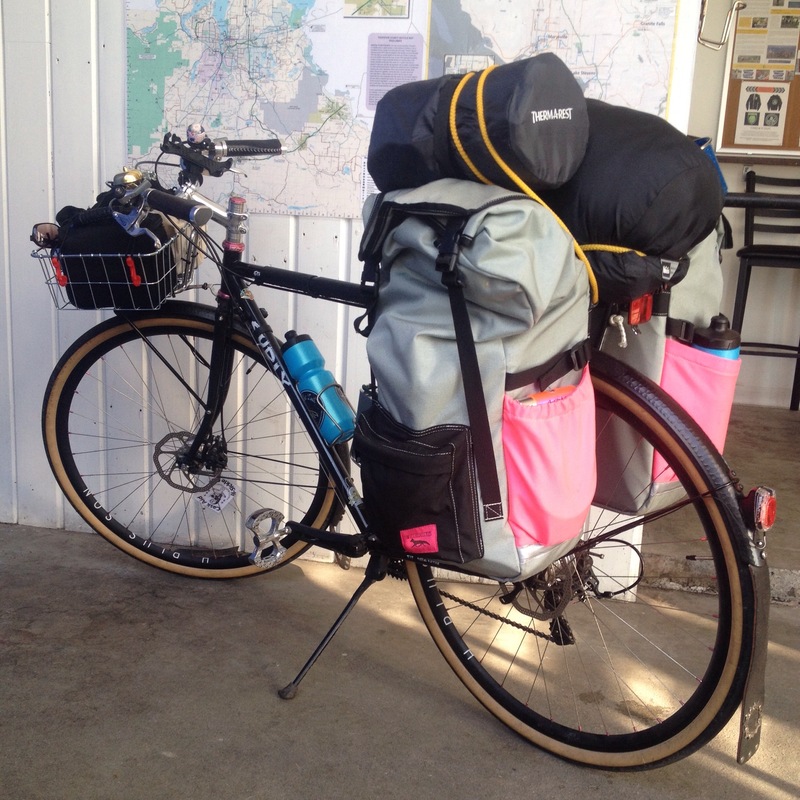 Note: I recently got an REI Halfdome 2+ for me and the kids to use this summer which will open up so much cargo space on the Big Dummy. I can’t wait to test it out! 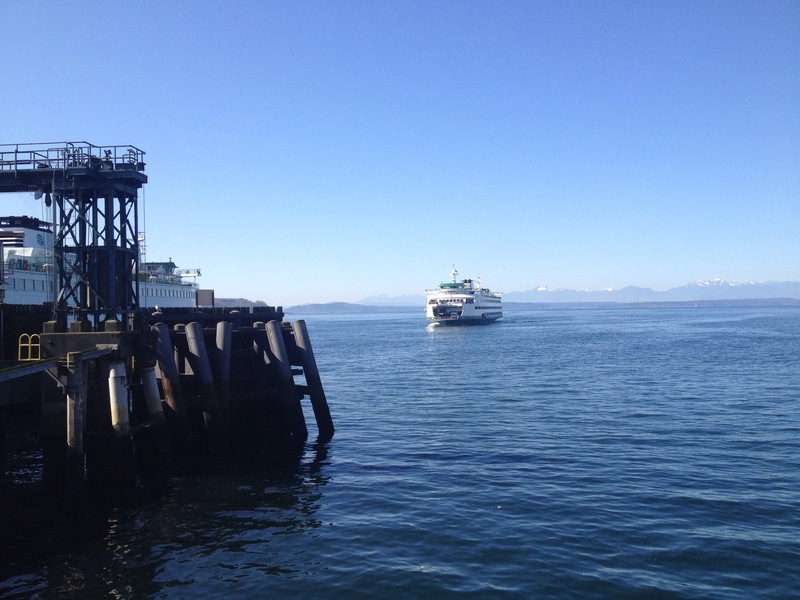 Alyssa and I arrived at the ferry quite early (which takes Orca cards now! That may or may not be new, but it’s new to me!) 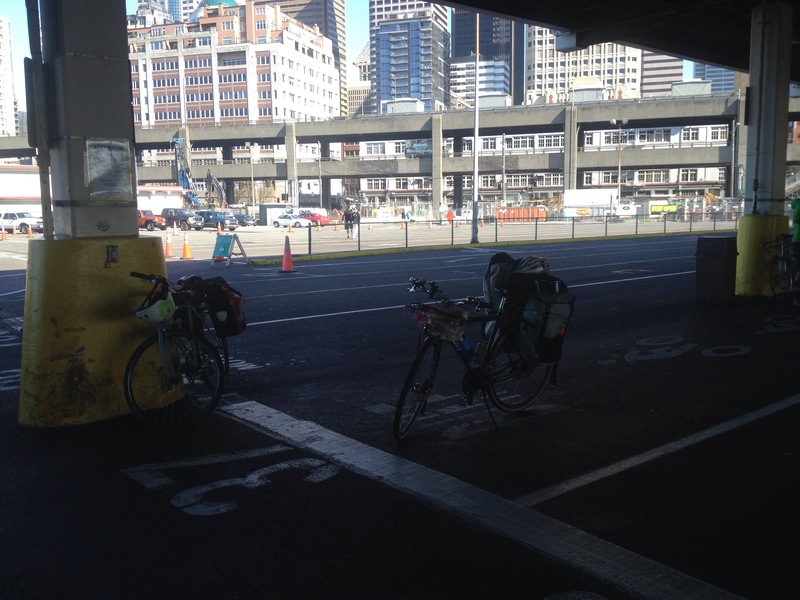 so we parked our bikes in the bike lane and hung out in the unseasonable sun. We learned there’s a Top Pot Doughnuts just across the walkway accessed from the ferry passenger terminal so we went for coffee and doughnuts. For summer family visitors: there’s no bathroom at this Top Pot, but it’s an easy walk with little legs and there’s a bathroom in the passenger terminal (as well as other food options). 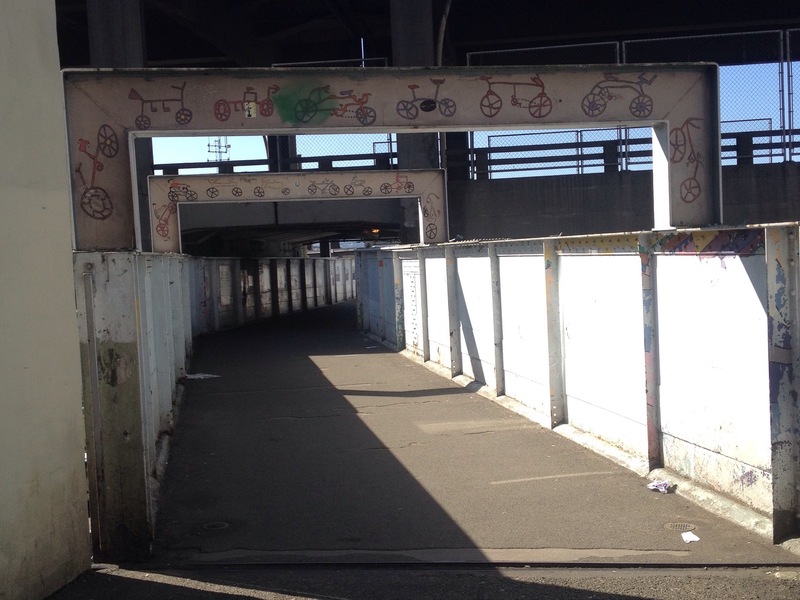 And look: bike street art on the walk back to the ferry! 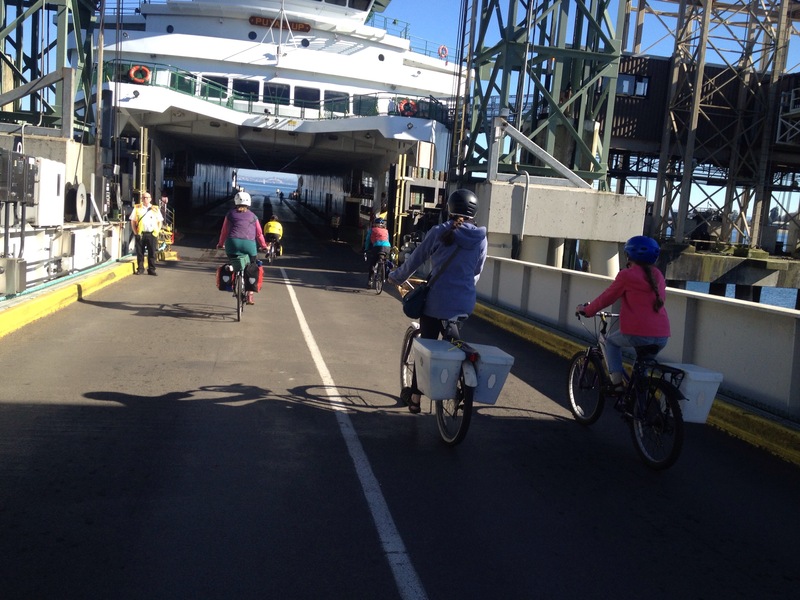 I still think there is nothing like biking onto the ferry. So exhilarating! We arrived and biked off the ferry, but stopped halfway up the hill, deciding to wait at the former gas station for the aggressive car traffic to clear out. This would be a good pitstop for the family biking trip, too. 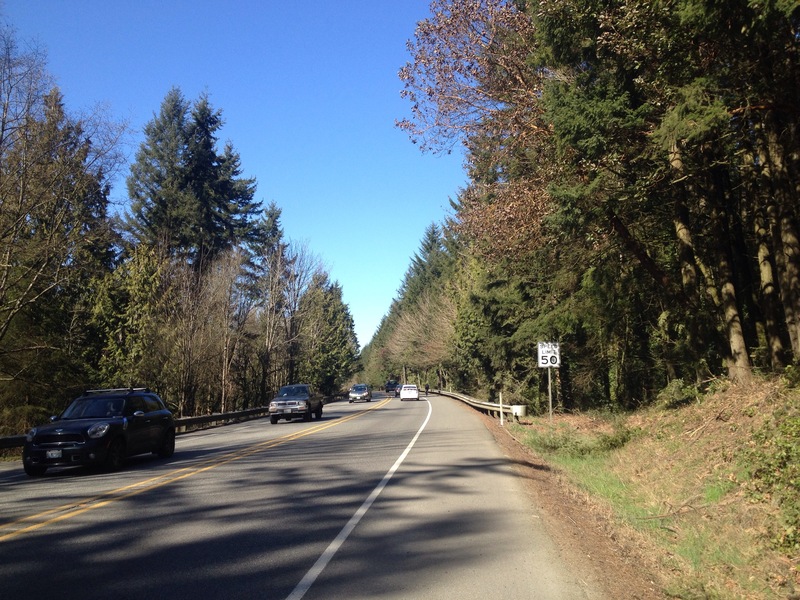 In the past we’ve followed the Chilly Hilly/Bike for Pie/non-highway route to Fay Bainbridge Park, but this time we tried the highway 305 route and OMG it was so flat! Granted, it’s hard to appreciate the difference riding with 75 pounds of bike + gear versus 200 pounds of bike + kids + gear, but I’m pretty sure it was much much milder. Though also much less scenic. 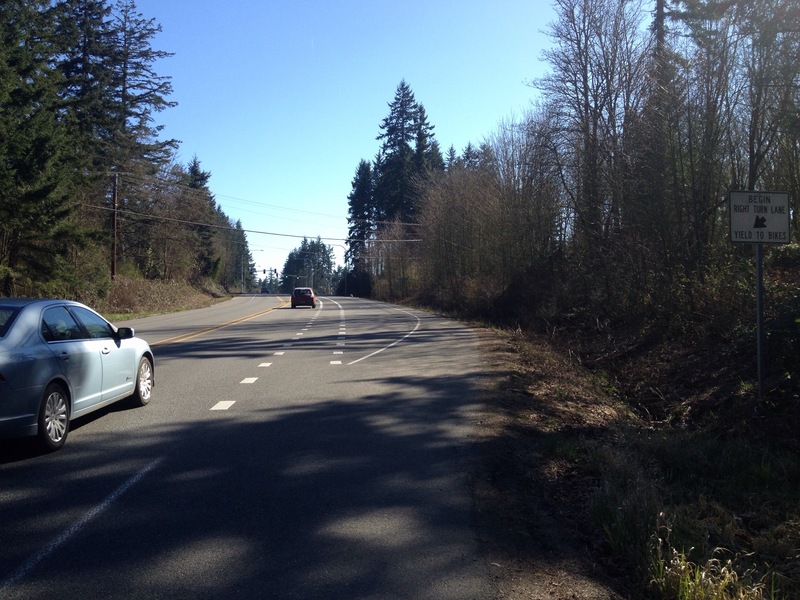 Later the speed limit increased from 40 mph to 50 mph, but it still didn’t feel worrisome with the nice wide shoulder. 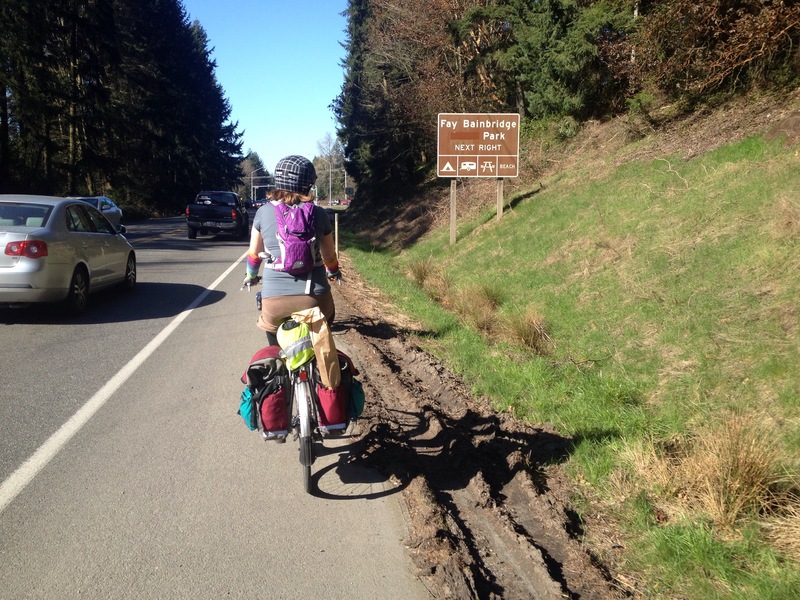 I’m curious to hear from the family bikers who’ve taken this route: did you like it and would you do it again? Tell me below in the comments. I think I’d like to do this come summer. In the past we’ve always camped down on the beach in the kayak-in spots, but this year we pitched our tent in the hiker/biker spot near the top of the hill. This was partially to honor the letter of the law, partially because the new camp host last summer wasn’t so cool about bikers camping on the beach, and partially because Jason Goods of Swift Industries/Get Lost Adventure Club camped at Fay the previous weekend and said it was cold and windy down on the beach. There are picnic tables and fire pits, but no bathroom up here. Plus it’s far from the playground. And kids have to walk down and up the car road to get to the bathroom and playground. So I’m undecided this is a better area to camp in the summer. I think it’s probably worth parking up here and then having one or two families walk down to see the cammp host and check on space. 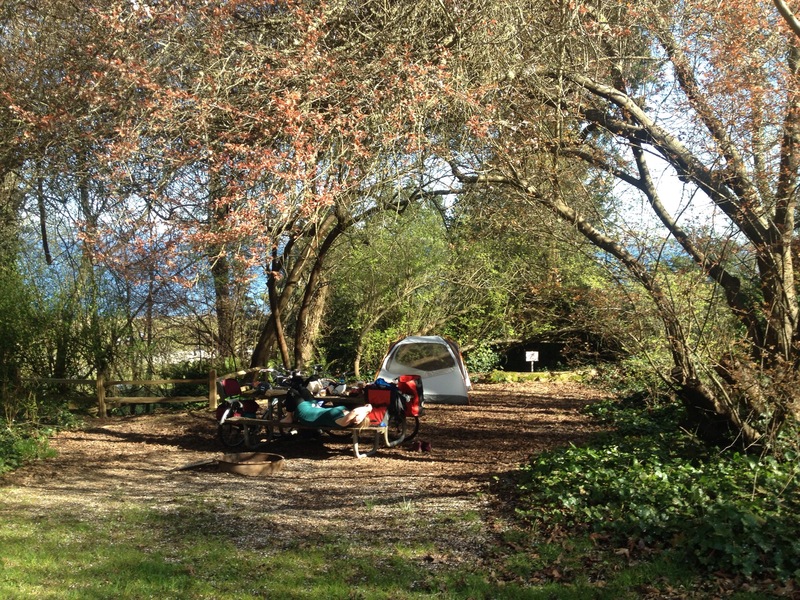 We saw a pair of bikers camping in a car spot. At $7 per biker, it might be worth squeezing into a car spot, though they’re not as nice and open as the kayaker spots. Again, thoughts welcome in the comments below! 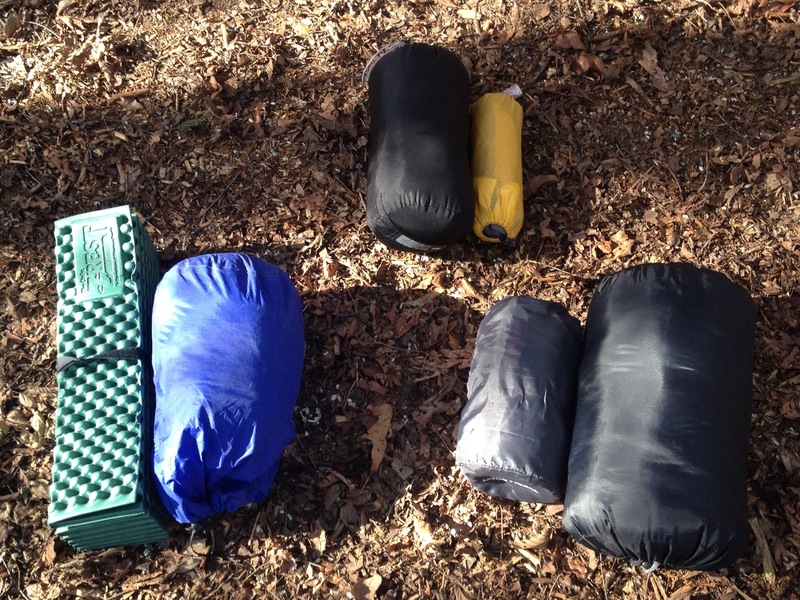 Unloading our gear, I noticed how bulky my sleeping bag/pad situation was compared to Alyssa (left) and especially Ellie (top). I might keep an eye out for a smaller sleeping bag. And a smaller but squishier pad because my hips could feel the ground through my Thermarest pad. I wasn’t sure what to do with myself once we were unpacked–I haven’t been camping without kids since I was a kid! 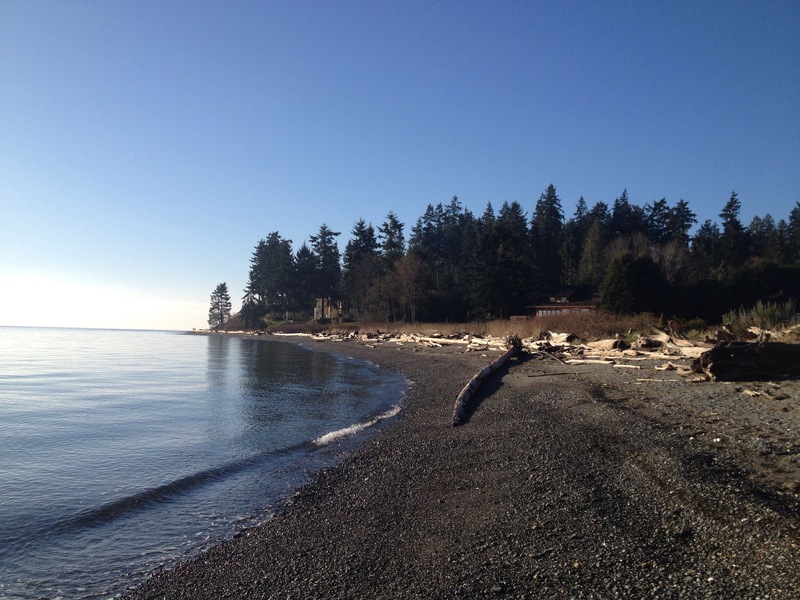 With no potty breaks to administer, snacks to dole out, or rock throwing to referee, we snoozed on driftwood at the beach. 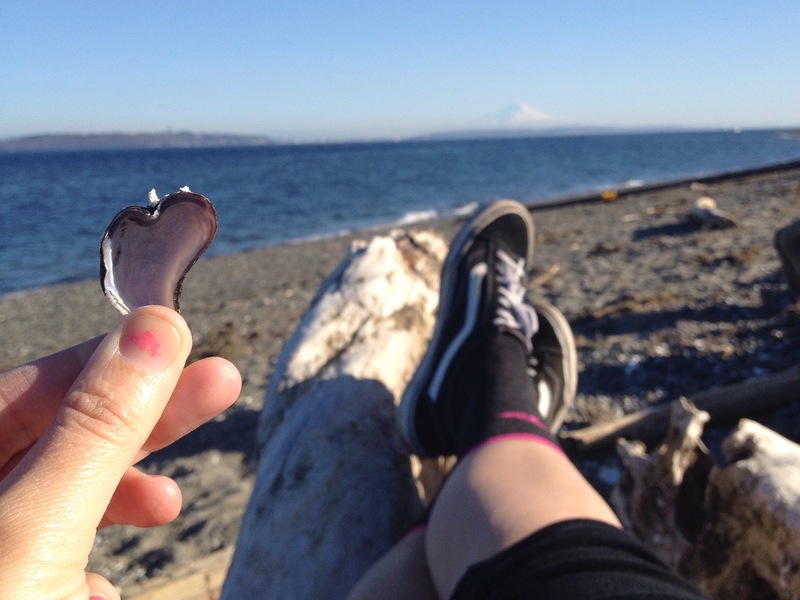 I found a heart-shaped shell and admired Mount Rainier. But it wasn’t too boring! Apparently I had told Alyssa that Ellie would bring coffee beans and told Ellie that Alyssa would bring coffee beans. Thankfully we discovered this Saturday evening and not Sunday morning. Alyssa helpfully offered, “Well, at least we have the instant coffee you brought!” but I decided that would be overkill with my chocolate-covered espresso beans and their beans and left it at home. So I offered to ride back across the island to the grocery store and pick up coffee beans. It was nice to get a sneak peak at our return route. I noticed one possible problem area on family bikes: approaching Madison Avenue there’s a narrow bike lane between the through-traffic lane and right-turning lane. It’s fine on the way north since it’s downhill, but a little claustrophobic on the uphill southbound route. So come summer I think we’ll take the right-turn bike lane on the edge of the road and then carefully make our way over to the left at the intersection. At the grocery store I got coffee beans, instant coffee, and the last box of Girl Scout Tagalongs. And met a women who said, “What a great idea! 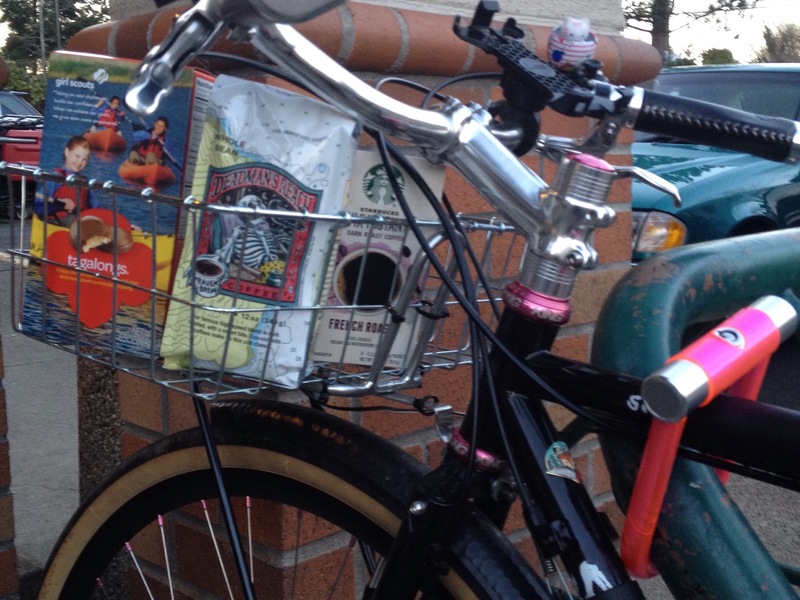 Going grocery shopping with a little basket on the front of your bike!” I hope she’ll try it soon. And I saw the world’s coolest dog. Whom I think I saw in Seattle the other day. 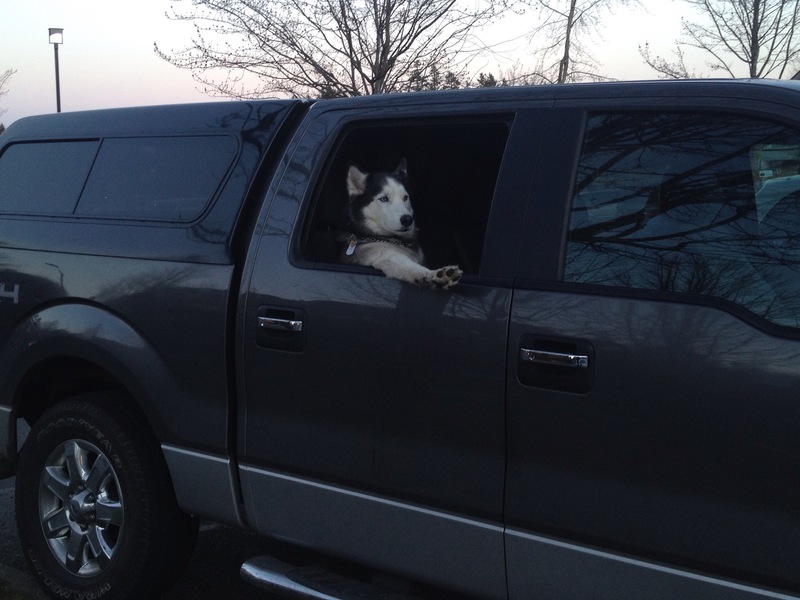 Unless dogs lounging out the window is a trend. While I was gone, Alyssa and Ellie prepared dinner in my little percolator. Oh, in case I forgot to mention it, I not only flubbed the coffee beans, I also forgot that I was the one who said she’d bring the cooking pots. It’s nice to have all this room to improve on next time! The morning was amazing, but I think we would have come even if it’d been drizzly. I started the morning with a long quiet walk on the beach and then we had coffee and pancakes (cooked in my percolator) down at a picnic table by the beach rather than up by our campsite. 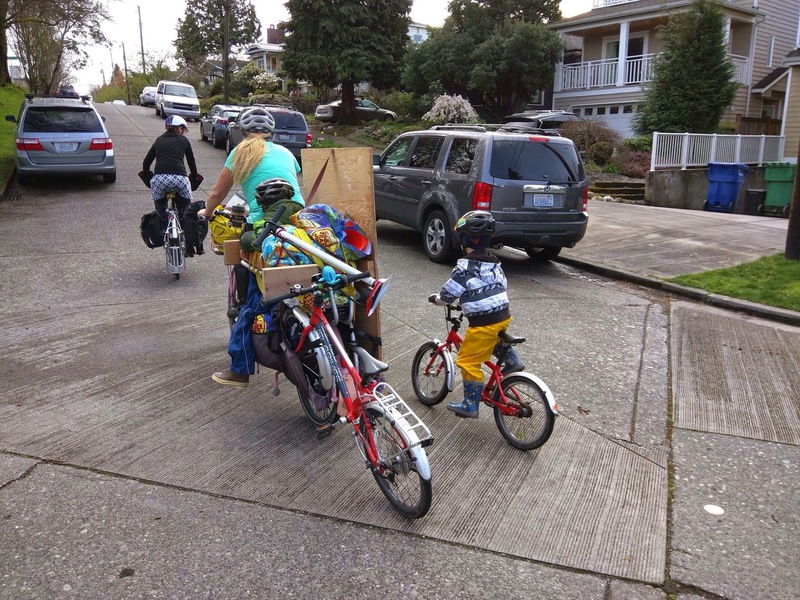 One advantage of camping up in the hiker/biker spots is not having to bike uphill from the beach, but I discovered last summer than it’s possible to bike a fully-loaded cargo bike up that hill provided the kids walk on the side. So I packed up my bike and brought it down for a photo. 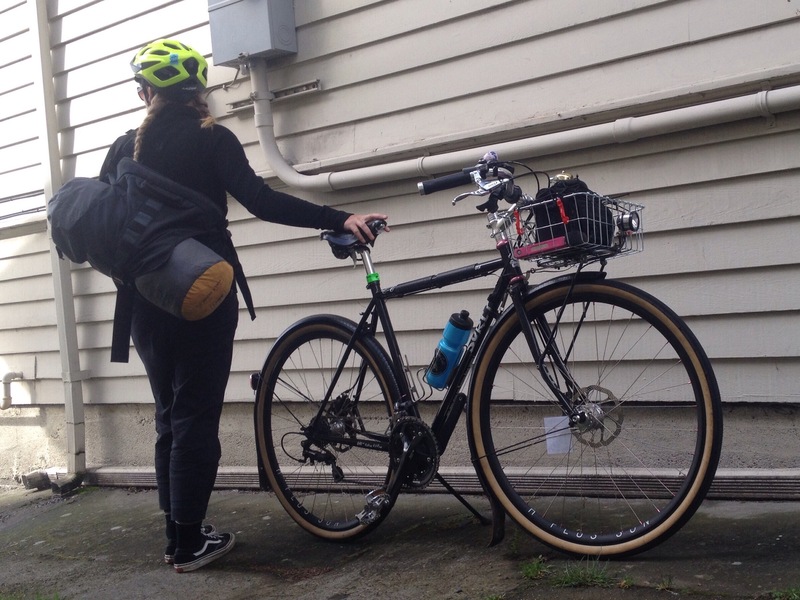 And Alyssa took her tent poles (cargo bike intervention, sigh) so I was able to close both my panniers for a [slightly] sleeker look. Climbing back up that hill wasn’t all that easy, but it certainly was doable. I was happy to rest a bit before we set out. And capture my sock situation for an Instagram: hi-vis Sean Sako‘s DeFeet on the car-side and punk rock Cars-R-Coffins on the forest side. I got a pretty good group shot on our way out with my iPhone wedged in my helmet vent across the street and my TimerCam Pro app set to 30 seconds while we changed the ABC song (this works great with kids!). Excellent timing because a car zoomed between us and the phone less than a second after the click. We opted to backtrack the route back to make sure it was as flat in the way in. Despite the lack of scenery compared to the hilly route, we still pass Frog Rock. I remember the good ol’ days when there was never a line at the frog, but we waited patiently while two guys on road bikes climbed around the frog and then took turns taking pictures of one another. 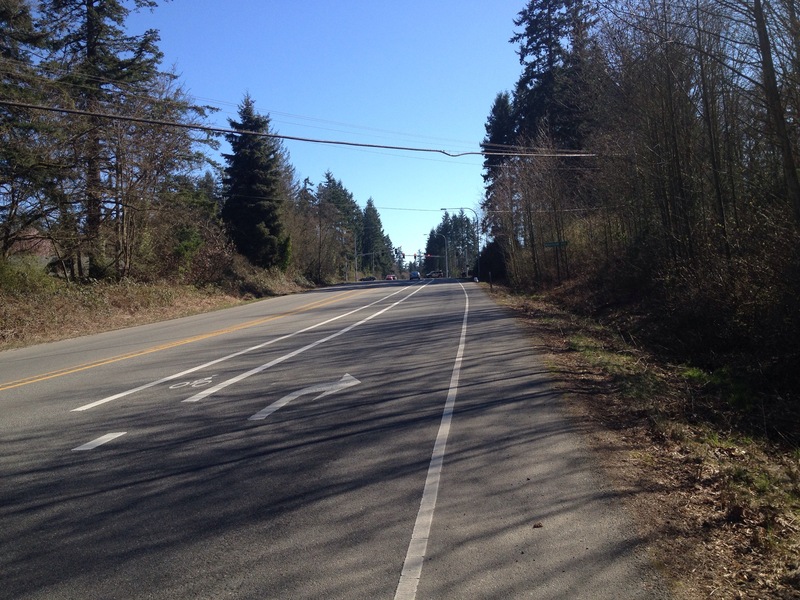 And more pictures of the bike lane leading up to Madison. It might be worth exploring leaving 305 before this point. I think I might need another test ride/test camp. 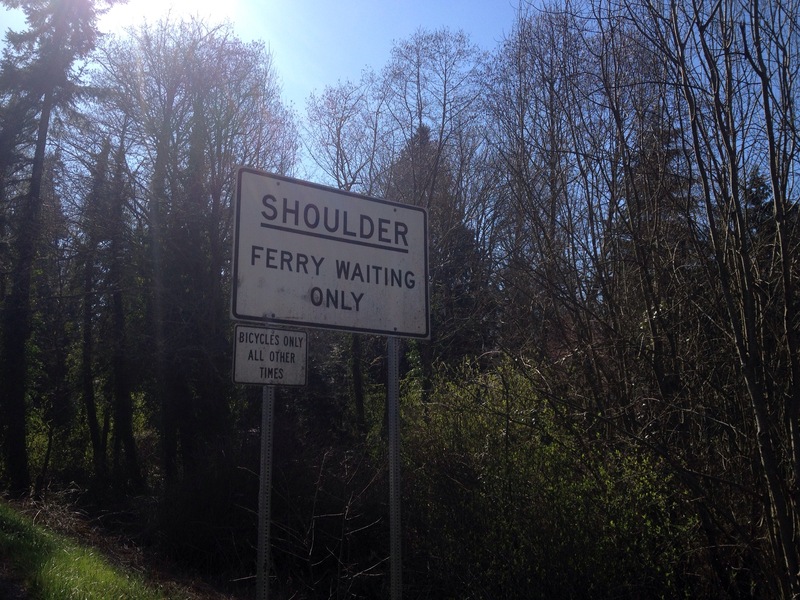 Not to mention the SHOULDER–FERRY WAITING ONLY signs that started quite a ways before the end of the highway. It wouldn’t be very pleasant to share the one car lane during a busy summer Sunday. 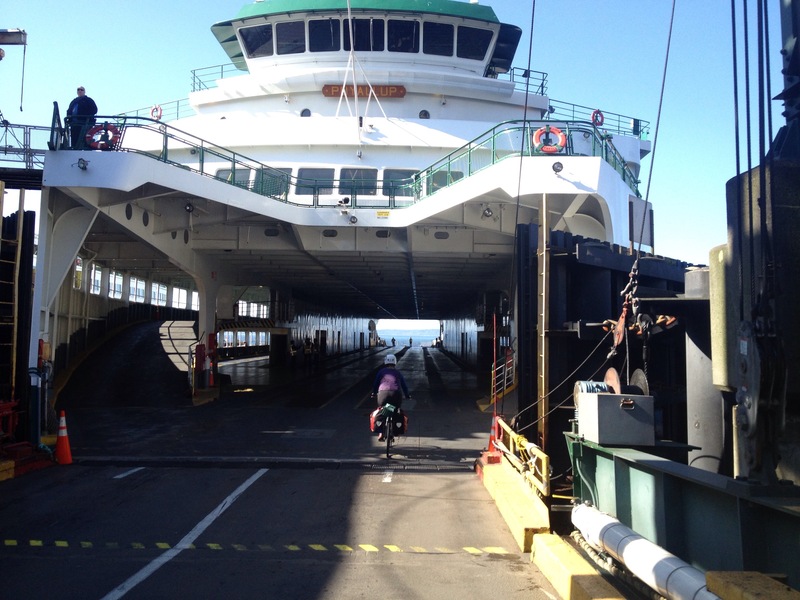 And then back on the ferry. The mom and daughter in the foreground were part of a family of four and the father was riding a bakfiets! I’m guessing they live in Seattle, in a flat neighborhood. As fun as it is to leave Seattle behind, there’s nothing like the view of downtown looming closer and closer as the ferry approaches pier 52. So, who wants to go camping?? 2015 means the most special pi day ever: March 14, 2015 = 3.1415! Let’s gather at 10:26:53 a.m. and get our math on. Yeah, that’s “pi time” in the Mountain Time Zone, but we’re going to just ignore DST and take that hour back for the day. I won’t have pie for you, but we’ll do lots of fun stuff with circles and spheres. Any and all math jokes and pi/pie jokes welcome! Meet us in Meridian Park–at the bike rack by the circular basketball court. It’s easiest to bike into Meridian Park from south side via Bagley Ave N. We’ll hang out for a bit of running around and chasing bubbles (spheres!) then take a nice, little two-mile bike ride to the empty Green Lake wading pool where I will set up a circular course with our teeter totter. 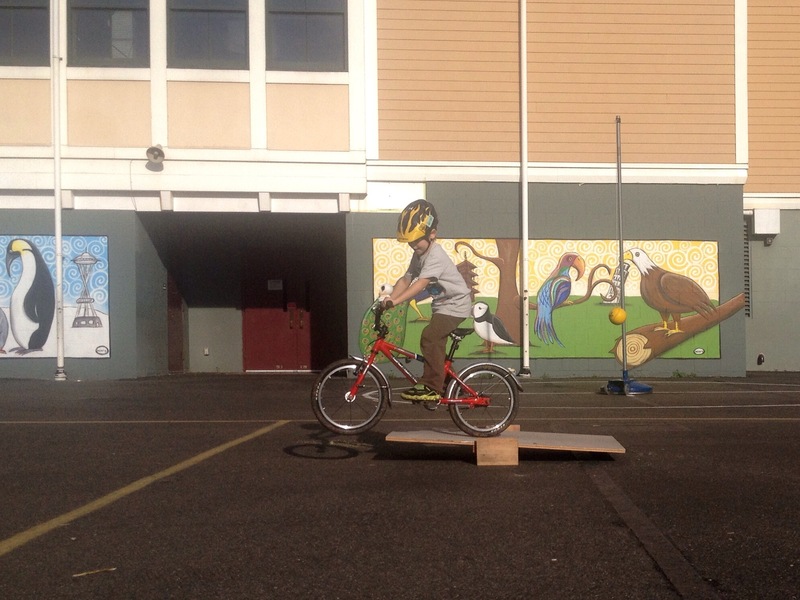 Note: longtail cargo bikes have a wheelbase length incompatible with the teeter totter. Note two: you’re not allowed to ask me how I know this. You’re encouraged to bring circular snacks and I’ll have clementines for everyone. For those in need of a proper lunch, Zeek’s Pizza is right across the street, or we’ll turn a blind eye if you must grab a rectangular sandwich from Urban Bakery. 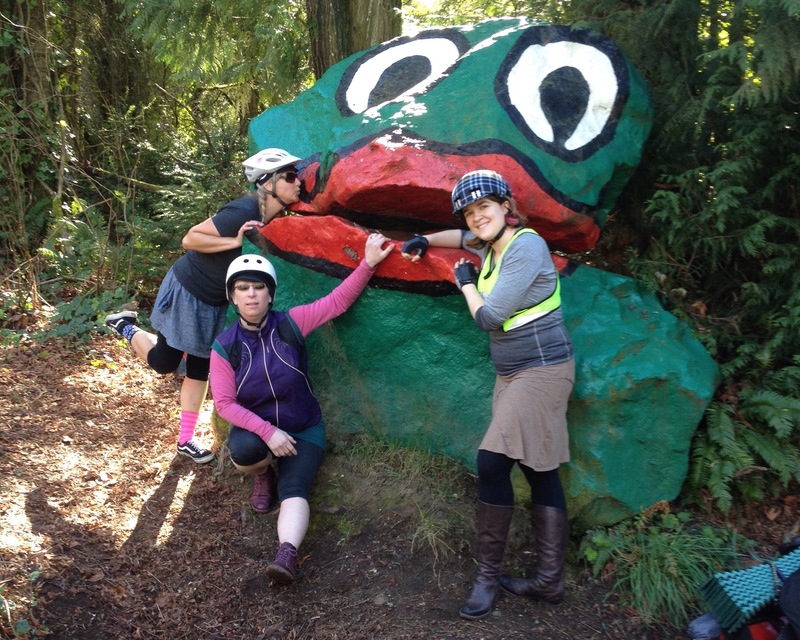 We’ll start massing back up at 1pm and head to Mighty-O Donuts for the Seattle Family Biking monthly doughnut meetup (if you’re in the Facebook group, RSVP here. Not gonna lie, I hope they’re out of apple fritters by this time of day so everyone opts for round doughnuts. Mighty-O is a Bicycle Benefits participant with buy one, get one doughnuts. Stickers are available there for $5 if you don’t have one yet and want to join the revolution. Winter is ending and all the fun bike stuff starting up! 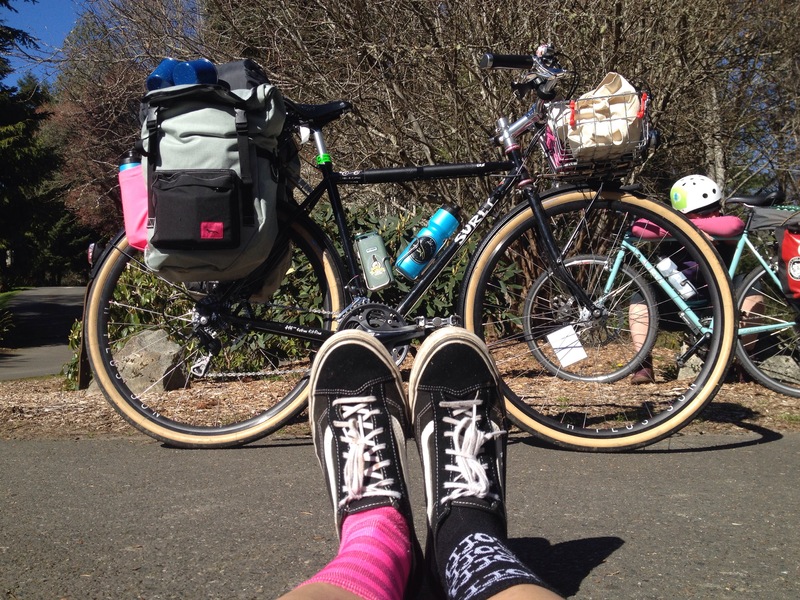 March is Women’s Bike Month in Seattle, April is 30 Days of Biking with pledging happening now, and today kicks off the Errandonnee: 12 errands in 12 days! I’m not sure today’s two trips will make the final cut for my control card or stay in the categories (Personal Care, Personal Business, You carried WHAT on your bike? !, Arts and Entertainment, Non-Store Errand, Social Call, Work or Volunteering, Store, Wild Card) I’ve chosen as of this writing, but it’s no fun to post an announcement about the challenge today without including my errand-filled day. First up, I ran a bike-shop-to-bike-shop errand for a friend. I decided this necessitated my dressing like a bike messenger so I donned all black and exchanged my little everyday Tom Bihn Imago messenger bag for my big Tom Bihn Super Ego messenger bag. Bike shop stop one was Sprocketts Recycled Bicycle where I played with Mama, the sweetest shop dog in the world. I promised to bring the kids over with me soon–our last visit was quite a while ago. And bike shop stop two was R+E Cycles where I pestered Johnny Latenight with tandem bike questions since there’s no shop dog. My original plan for the day had been take a big grocery shopping trip with the Big Dummy, but since I was stuck on my little bike I had brought both panniers and an IKEA picnic bag. Between those and the Super Ego, I was able to carry a full load! 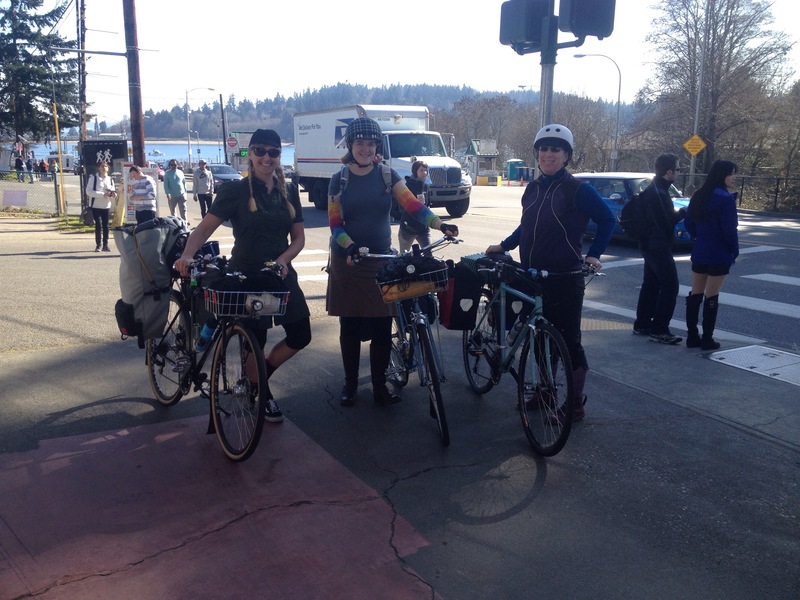 Second errand was the #WomenWhoBike Ride, organized by Pronto Cycle Share. There was an amazing turnout and terrific weather. Note: in this city, terrific weather usually doesn’t influence the turnout one way or the other–we’re a tough batch (relatively speaking as there’s no snow here). What I learned/observation: A woman waiting to turn left into a parking garage across the 2nd Avenue protected bike lanes asked the valet, “Why are there so many bikes?” Woo hoo! We were a big group, though I think rush hour generally has lots of bikes up and down 2nd. 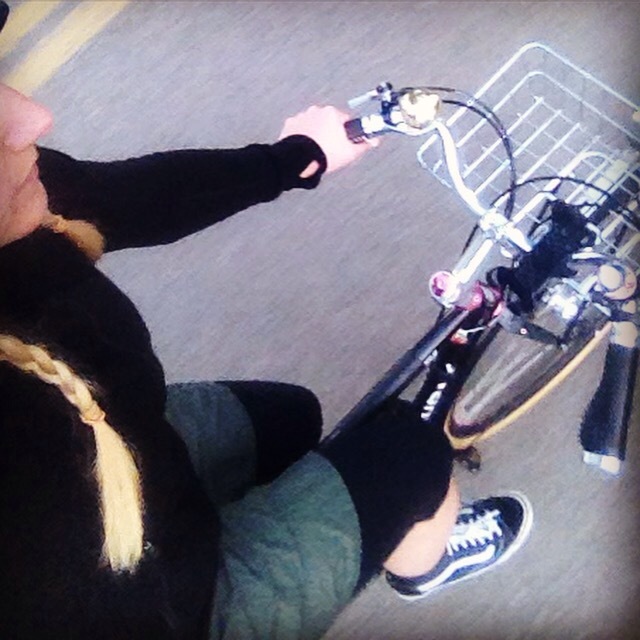 Unless you really haven’t been paying attention, you know I simply adore 30 Days of Biking! The 30 days happen next month, but pledge to participate now. It’s fun to receive your pledgee number–I was first last year!–and think of your reason for riding to share with your pledge. 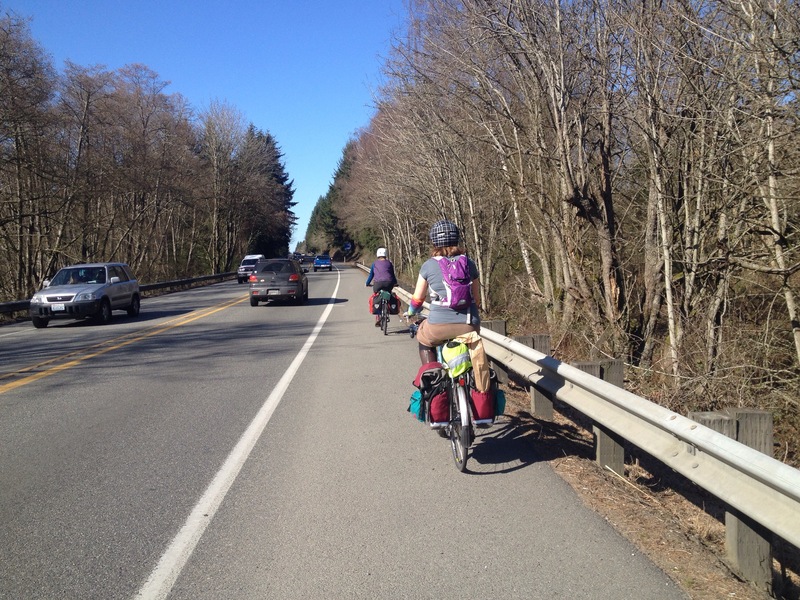 Astrid will kick off the month with a weekday ride on April 1st: 30 Days of Biking Kick-Off Ride – Mill Creek and then we’ll lead a Saturday ride together. 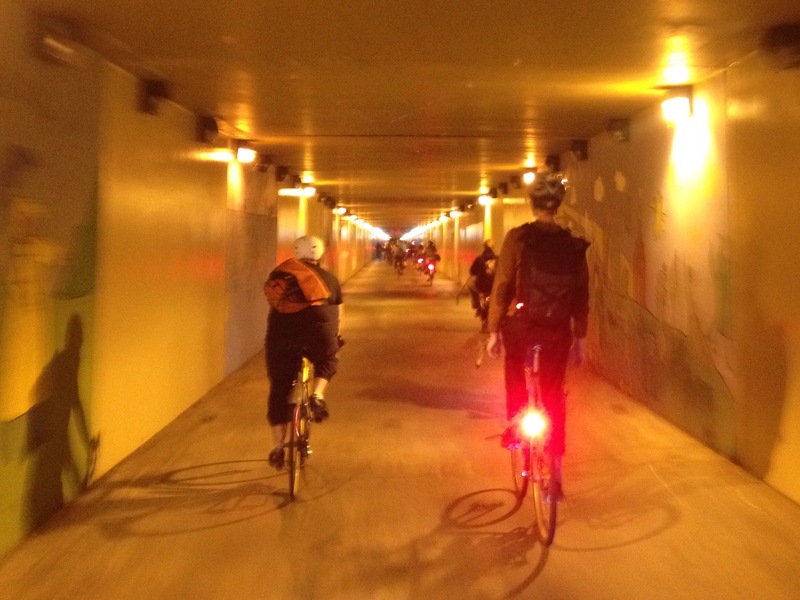 Note: you don’t have to be participating in 30 Days of Biking to join us on this ride. Whether or not you are a 30 Days of Biking pledge, come out for this easy, scenic, and fun ride featuring waterfront vistas, riding on both streets and trails, plus coffee and food stops! 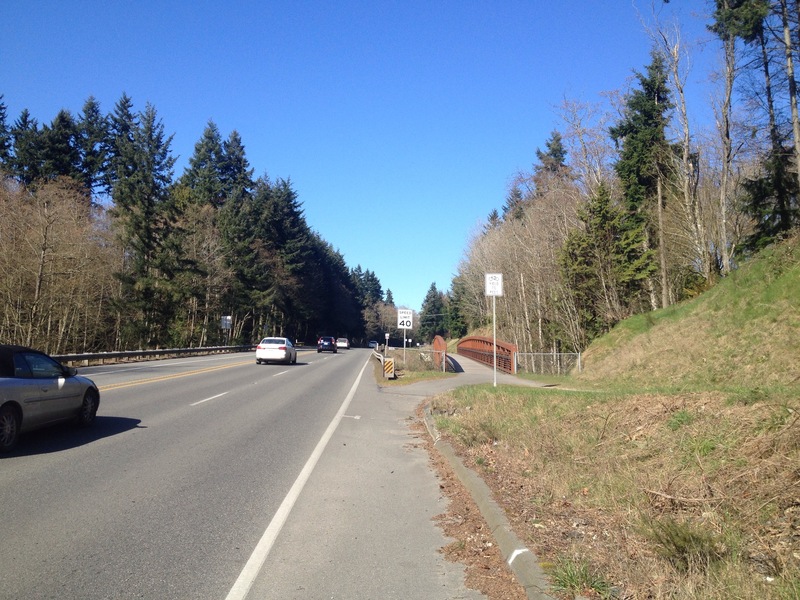 We’ll start on the Burke Gilman Trail on the sidewalk by the foot of the Wallingford Steps. 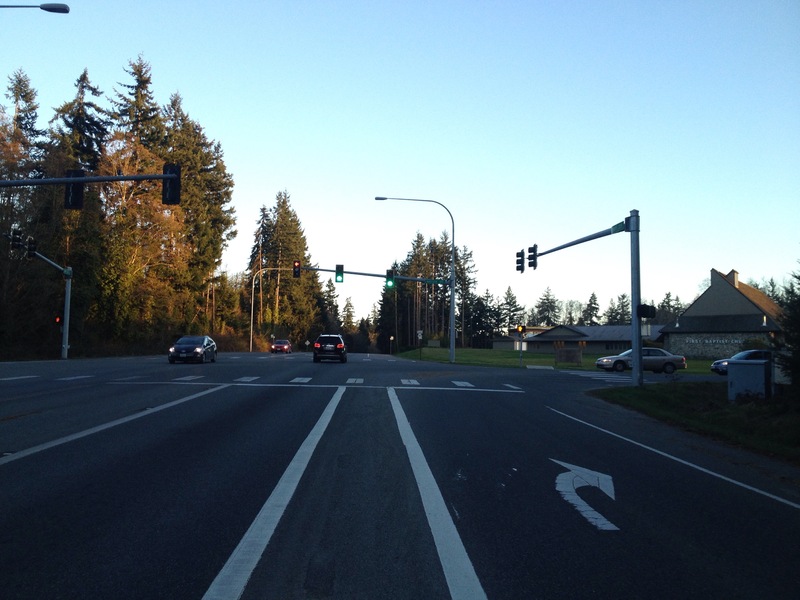 This is located on the north side of North Northlake Way, between Densmore Ave. N. and Burke Ave. N. If you are arriving by car, parking is easy at Gasworks Park, but crossing the street in a group is tricky, so we are meeting on the sidewalk just west of the park and across the street. 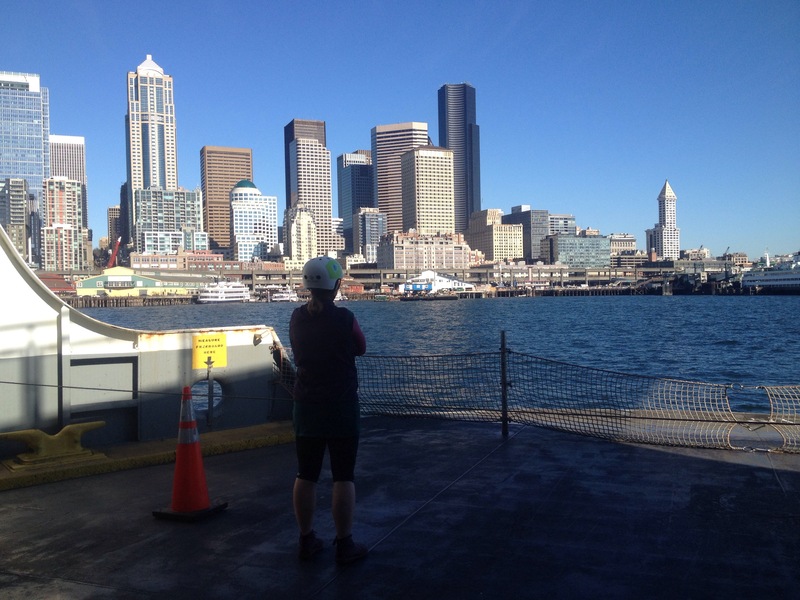 The ride will follow the Burke-Gilman Trail, cross the water at the Fremont Bridge, then take the Ship Canal Trail to the Salmon Bay area. We’ll stop at Caffe Appassionato for coffee to go (BIKES ARE ALLOWED IN THE DRIVE-THROUGH! SO FUN!) and take it over to Fisherman’s Terminal to enjoy the view. Fortified, we’ll head to the Locks and walk our bikes through to Ballard, then ride to Maritime Pacific Brewing Company for a lunch stop. Back to the start via streets and Burke-Gilman Trail. Bring money for the refreshment stops, and come early to get the safety briefing. In the spirit of 30 Days of Biking, the ride will happen rain or shine, but will be much shorter if the weather is bad. Note: This is a Cascade Bicycle Club Free Daily Ride. All participants must wear a helmet and sign a waiver. Read more about Cascade Free Daily Rides.